This lavishly illustrated science fiction story features an adolescent farm boy from Nebraska and a young Martian girl who ultimately save the galaxy from evil aliens. Isolated on his family farm with possibly divorcing parents, Gilbert is falsely suspected of creating crop circles on a nearby farm. When he meets Aoleon The Martian Girl one night after her joy ride making the circles, they soar off in her spaceship to avoid the angry neighbor and his loaded shotgun. Through her telepathic powers, she learns to communicate with Gilbert as they head toward her home planet. They enlist the aid of a Martian resistance leader (disguised as a pizza delivery man) and an enormous robot to rescue her kidnapped parents from the Luminon — shape-shifting, milk-guzzling aliens intent on destroying all human life in order to steal Earth’s cows. Enhanced by engaging, vividly colorful computer-generated artwork and an original font style beginning each chapter, this book has strong visual appeal. The author often plays with names (Vice President Richard Tator, etc. ), expressions (Aoleon shouts “Deus ex machina” whenever unexpected solutions emerge) and other elements. These amusing moments, combined with action, science, pop culture spoofs, and a glossary, should keep readers hooked throughout. Though imaginatively conceived and designed, the text includes some distracting inconsistencies. Even taking perspective into account, height differences between the two children vary from picture to picture. 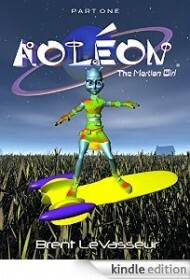 Aoleon and other Martians sometimes speak without contractions; other times they use contractions and American slang, such as “Everyone okay?” and “Let’s get a move on.” When lost in the Martian desert, Aoleon uses telepathy to search Gilbert’s memories of The Wizard of Oz, but later asks Gilbert, “What is divorce?” as if she couldn’t read his thoughts. Despite these inconsistencies, Aoleon The Martian Girl offers fresh and funny entertainment that should hold special appeal for teenaged readers seeking likable heroes — the kind who can outwit the grownups on any planet. BlueInk Heads-Up: This ebook is offered in conjunction with several video games loosely based on the story, as well as an original song.